Francesca, Simone and little Dora live in the old town centre of Jesi, a small and charming town, which has been a bustling industrial hub right since the late 19th century, to the extent that it earned it the name of “Milan of central Italy”. "We live in a housing complex created on the remains of SIMA, Jesi’s most important 20th century company," says Francesca. "It produces agricultural machinery and machines used in the oil industry, and the building maintained that industrial feel we are so fond of." "The first time we visited our home it was night-time, pitch dark, with a torch," says Francesca. "The owner led us up a ladder and, despite the rain and the adverse conditions, it was love at first sight." The flat is spread across two floors. 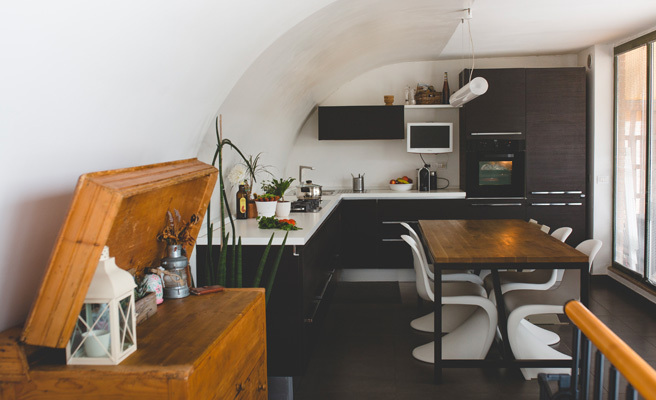 The sleeping area and living room are on the bottom floor, while a spacious terrace featuring a half-vaulted roof and overlooking the old town centre takes up most of the top floor. 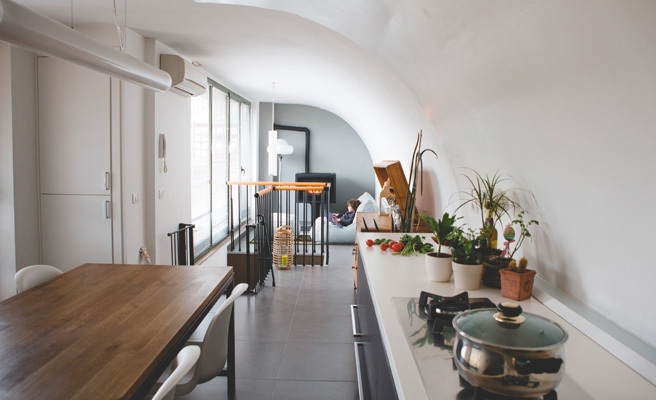 The long and narrow covered area, with large windows overlooking the terrace, comprises the kitchen and a lounge, with a total surface of some 45 square metres. “We use this space a lot, especially in winter. This is the area of the house where we really relax, because this is where we eat, read and play with Dora,” says Francesca. Francesca and Simone thought of putting a heating element in this area right from the beginning to make it warmer and cosier. 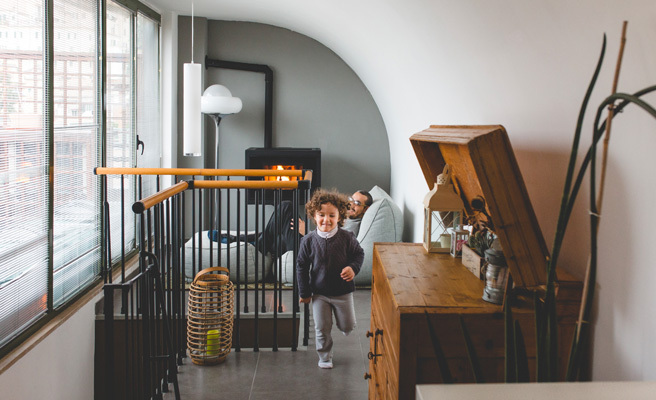 However, the limited height of the ceiling, just 2.30 metres, was fairly significant a structural issue for the installation of a wood-burning fireplace – which was Simone’s dream. 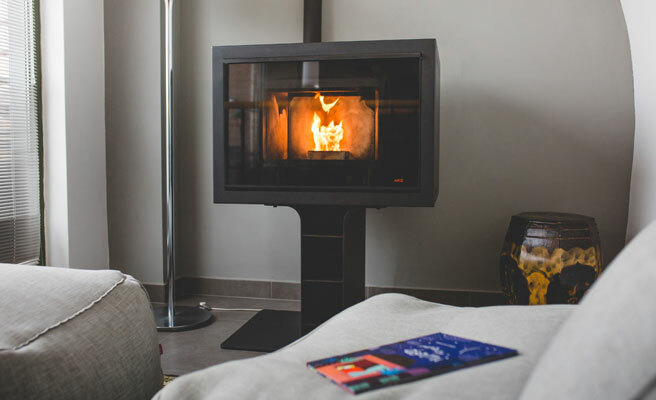 Indeed, in order to ensure a good draught any wood-burning product needs a flue measuring at least 4 metres, instead of 1.5 metres required for pellet products. 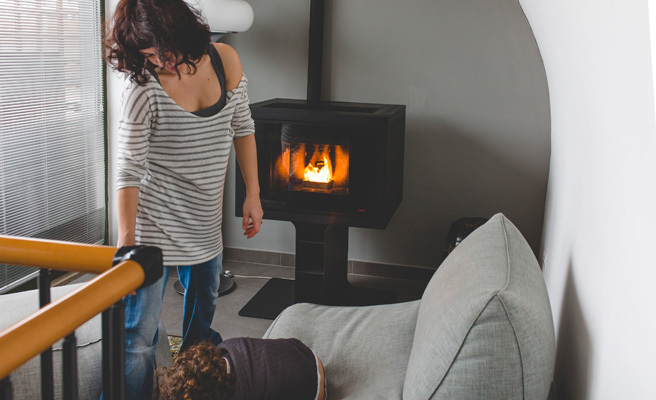 By choosing a pellet-fuelled product, Francesca and Simone discovered a world of alternatives that are equally valid from an aesthetic point of view and even more convenient. 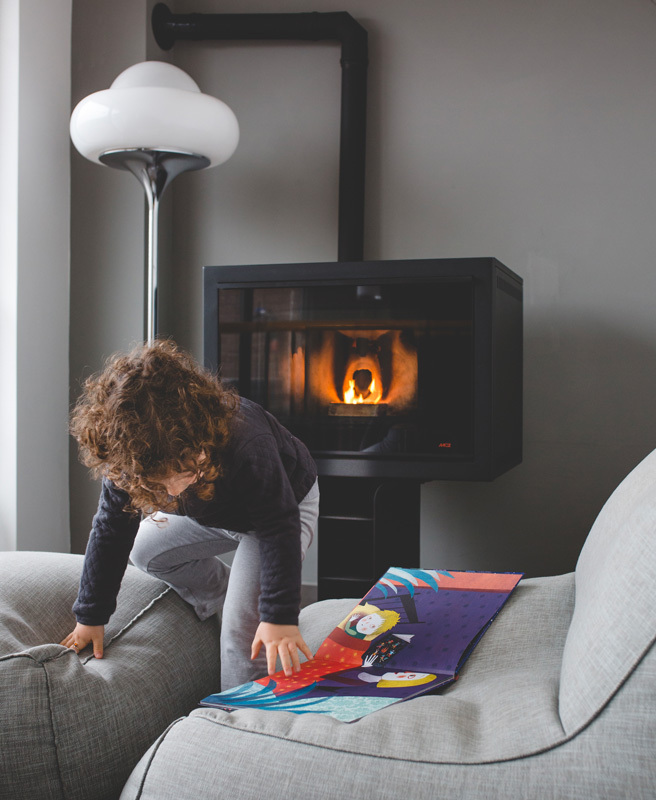 The MCZ stove, a 2008 model which has now been discontinued, is now a key element of the house and the atmosphere it creates is perfect for a kitchen where there are often friends over for dinner. Located at the bottom of the corridor, in front of the large glass window, it goes perfectly well with the simple and modern interiors featuring classical contaminations, like the old family bread chest. The stove is the only element that heats the room. The stove stays on more in the evenings, when the family enjoys the warmth in the area even after dinner. This kind of use requires very little maintenance. “We clean the brazier once a week or, when we use the stove more, every 4/5 days,” says Francesca. "This is also possible thanks to the use of top quality pellets, whose higher price is offset by their higher heating capacity, as well as smaller amount of residual ash." 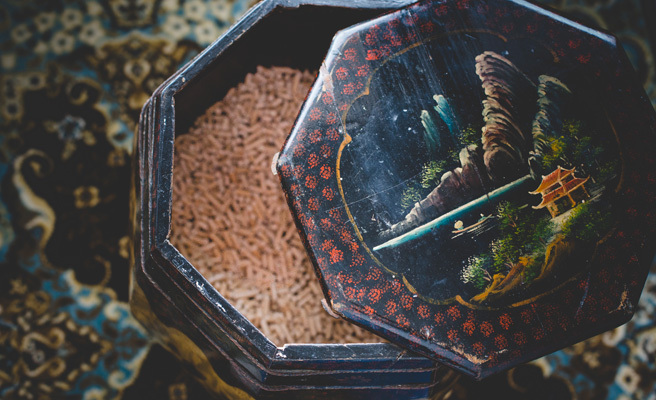 Francesca found a decorative solution to contain the pellets: an Oriental-style wooden container she found by chance in an antiques market. Once it is opened, one just needs to empty the bag of pellets in the container and that’s it.